Hard Cover, 246 pages, 6.25 x 9.25. After penning an article for the Chicago Tribune's Good Eating section in 2003 titled "The Lightening of American Beer," author and beer history expert Bob Skilnik wondered if  having chronicled the differences between today's beers and those of the generations before us  could he shed some light on beer's historical use in American food or as an accompaniment. The result is his sixth book, featuring over 90 beer-related recipes and a fascinating, mouth- watering account of the birth and rise of our nation's brewing industry and its lasting influence on American cuisine. As the last chapter of Beer & Food: An American History comes to a close, the culinary-loving, beer-drinking enthusiast will have a unique understanding of the history of American beer and food, and why a simple grilled Wisconsin bratwurst soaked in an American pilsner can be just as tasty as the pairing of an overpriced imported cheese with a questionable European beer. Combining American beers and foods is a unique art, tempered with hundreds of years of rich history and often the vision of determined artisans. A glimpse of their efforts can be seen in the old and new food recipes that use beer as a great tasting ingredient...just waiting inside Beer & Food for you to enjoy! "Skilnik, whose previous books include The Low Carb Bartender, traces the history of American beer from Colonial times through the 20th century in this intriguing work." "Bob Skilnik's Beer & Food is a tasty history, from beer soup to Beer Nuts, with pickled pigs' feet in between." 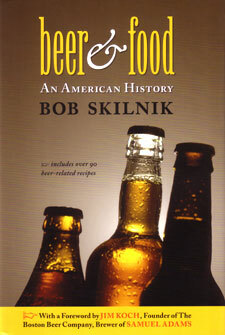 "Author Bob Skilnik offers an academic and enjoyable read about the role of beer in the American kitchen, from colonial days through the 21st century, drawn from old cookbooks and brewing histories. Beer & Food: An American History offers 'receipts' of the period as well as contemporary craft brewers' own recipes for a book that's half history, half cookbook. It merits a pint of your favorite ale by your side so you may sip and browse throughout!" "Beer & Food proves once again that beer has always held a place of prominence at the dinner table." "With restaurant & beverage critics increasingly focused on the emerging beer & food pairing scene, this timely book puts the evolution of this under appreciated area of culinary arts into a historic perspective. Kudos to Bob Skilnik for creating this absorbing and informative resource." "In his smart and engaging history of beer and its relationship to food, Bob Skilnik demonstrates that the today's trend isn't the first time Americans "discovered" the joys of good beer with good food." "The first book that gives a historical look at why beer and food are truly partners in today's kitchens."